Provide comfort for the family of Helen Reid with a meaningful gesture of sympathy. Peacefully entered into rest at the Maplewood Long Term Care Facility, Brighton on Tuesday, April 2nd, 2019. Helen Reid (nee Keller) of Foxboro died at the age of 89. She was the daughter of the late Frank & Stella Keller (nee Reid) and wife of the late William Reid. Helen was the loving mother of Rodger of Stirling, Randy, and Rodney, both of Halloway and Susan of White Lake. 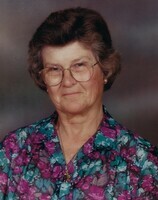 She was the dearest grandmother of Rita, Clint, Jason, Michael, and Christopher and great-grandmother of Stanley & William. Helen is survived by her sister Marion Dafoe of Foxboro and is predeceased by her brothers Orval Keller and Ronald Keller. She will be fondly remembered by her many nieces and nephews. Consider providing a gift of comfort for the family of Helen Reid by sending flowers. Randy and Clint and family ...Karl and I would like to send our sincere sympathy to you and the family. Mrs. Reid was very good to Clint and Jane. RIP Mrs Reid..a lovely woman..Phyllis Leavey-Gimpel, Karl Gimpel and family. Our deepest sympathies to all of Helens family. We will never forget her warm smile and generous spirit. She was a wonderful friend to our mother and visited her often with Marion on many occasions. We will be forever grateful for that. Mom spoke so highly of Helen and looked forward to those visits. May you all find comfort in knowing that she is with the Lord and that she loved you all so dearly. Ken and Betty Reid's family. Helen was the exemplar image of what a good mother to her children should be. She stood by her four through thick and thin. There will be a special place in the Lords Garden for her and Bill. Lots of sunshine and flowers. Kick back and relax Helen! You have earned those stripes and medals with dignified resolve.